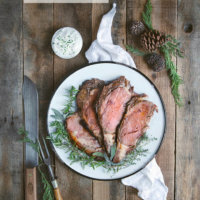 When you want to serve a special meal, this melt in your mouth tender Smoked Prime Rib Roast is grilled to medium rare perfection with a delicious garlic and herb crust. Sponsored by Harris Ranch Beef Company. Entertaining outdoors comes naturally for us Californians. Our patios are like an extended living room for us. And in Southern California, this outdoor living room is open for guests all year long. Although it is December and Christmas is a week away, our grill is still in full operation. A Christmas dinner outdoors? Why yes! 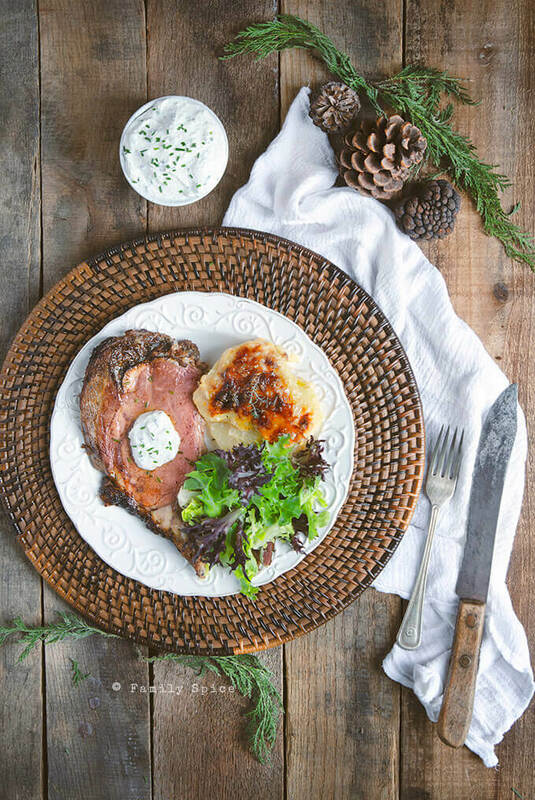 And this recipe for Smoked Prime Rib with Garlic and Herb Crust is the ultimate meal to serve during the holidays. What cut of meat is Prime Rib? The Prime Rib is also known as a standing rib roast. As the name suggests, it comes from the back of the upper rib section of the steer. It includes a total of seven ribs and the meat is marveled and is super tender and moist. Because the muscles aren’t heavily used the prime rib is extra tender, and the fat keeps it extra juicy. You can get the roast bone-in or boneless, and can be cooked either way. For the grill, I prefer keeping the bone intact for added flavor. The ribeye steak is cut from the prime rib before it is cooked. It is the best part of the prime rib, but in a smaller portion. The standing rib roast is one of the best cuts of meats to choose from. It is no wonder why so many choose this cut to make a glorious meal for the holidays or any other special occasion. When choosing a prime rib roast, you want the meat to have a lot of marbeling and to come from a reputable ranch. If you live in California, then you probably have heard of Harris Ranch Beef Company. 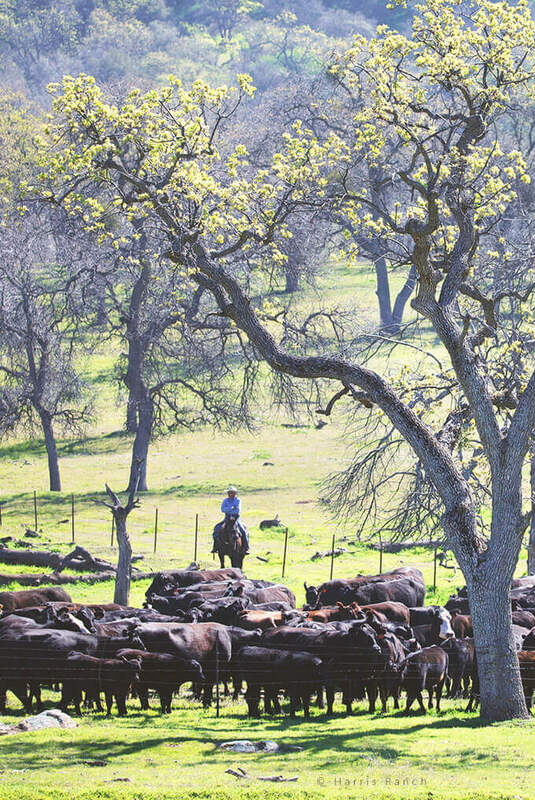 Established in Coalinga, CA in 1937, this family run farm has grown tremendously. For those of us who drive between San Francisco and San Diego regularly, we always pass by their cattle ranch, inn and restaurant. We even stop by to stretch our legs and enjoy a delicious meal. Their beef is minimally processed and contains no artificial ingredients. 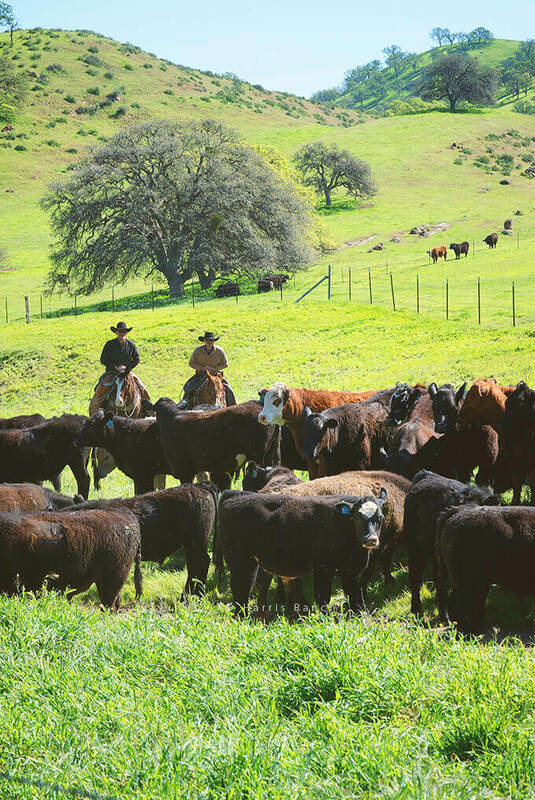 Their cattle spend most of their time grazing on grass, with only the last 120 days eating a grain based diet to add flavor, tenderness and juiciness to the beef. And yes, their beef is seriously some of the best quality that I have ever purchased on the consumer level. I have tried a variety of cuts of Harris Ranch Beef over the years and have always been impressed with the quality and flavor of their meats. Like most roasts, there is a little work involved in getting your prime rib ready for the grill. 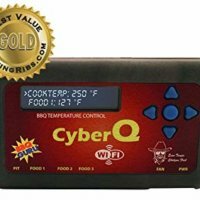 The golden rule of cooking any meat, is to make sure your meat is at room temperature and is not cold from the refrigerator. For my 3-rib roast, I let it sit on the counter for 3 hours prior to grilling. 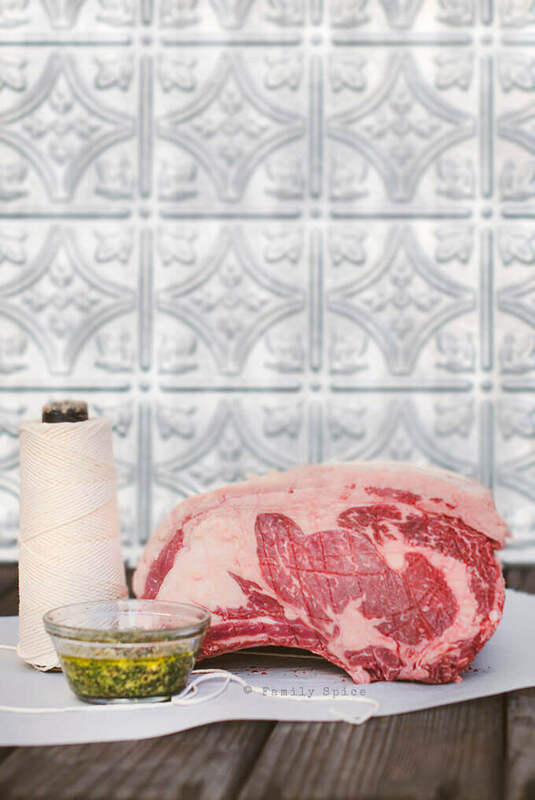 The prime rib roast is surrounded by fat and requires a lot of trimming, if your butcher has not done it for you. I confess that I did not cut away as much fat as I should have, as I received the roast directly from Harris Ranch. I still had a wonderful and juicy roast despite this mistake on my end. You only need about 1/4-inch of fat around the roast. Again, if you have a butcher who can do the work for you, then you can skip this step. Do tie some butcher’s twine between the ribs. As the prime rib cooks, the twine creates indentations in the crust to help mark where you need to cut between the rib bones. You don’t use a wet marinade for a prime rib roast, but a dry rub. The more my husband and I grill, the more we prefer the dry rub to a wet marinade when grilling beef. This rub uses a little extra virgin olive oil and a whole lot of chopped fresh herbs, like sage, rosemary, thyme and chives to make a paste that sticks to the roast. Add in some crushed garlic, kosher salt and pepper and your kitchen will smell like a dream as it rests. After your roast is trimmed of excess fat, rub it all over with this garlic and herb mixture. Then let it rest for 2-3 hours on the counter until it reaches room temperature. You can also rub the roast down the day before. Simply cover your roast with plastic wrap over the garlic herb rub while it sits in the refrigerator. Then 2-3 hours before you grill your roast, let it sit on the counter ’til it reaches room temperature. 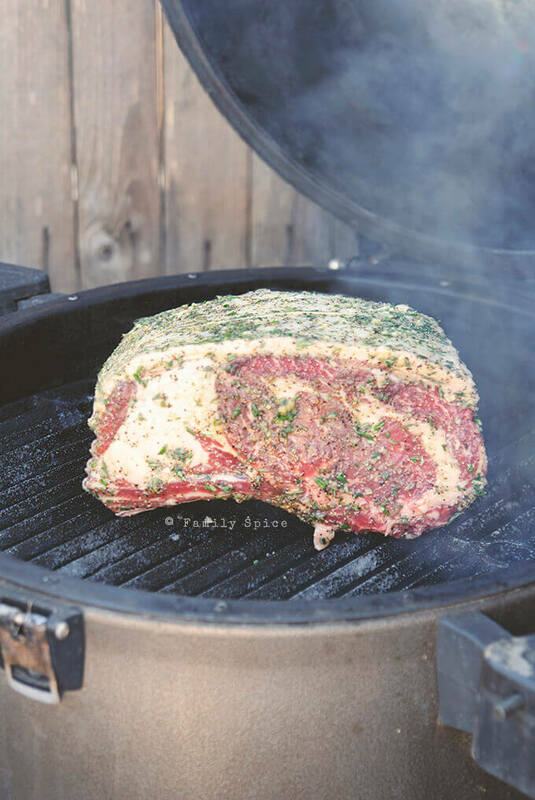 You want a super juicy and tender prime rib, and this requires some low and slow grilling. 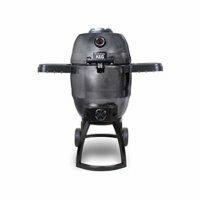 Although I love cooking over fire in a more primitive setting, I defer to my husband for techniques on smoking and grilling meats. It’s his latest obsession! We use our Big Steel Keg for our smoked prime rib. 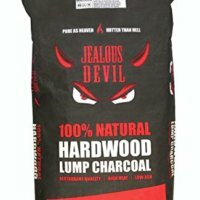 Using a mixture of mesquite hardwood charcoal and regular briquettes we brought the temperature of the pit to 250ºF. My husband also soaked some pecan wood in water and we used that for additional smoky flavor. You can grill your prime rib roast like this until it reaches an internal temperature of 125ºF for medium rare. Or you can grill it until 105-100ºF, then crank up the grill temperature to 400ºF so you can create a crispy crust around the roast. How long does it take to grill your prime rib? My 3-rib roast weighed about 9.5 pounds and took about 3 hours for it to reach 110ºF. Then about another 45 minutes of additional heat to finish the crust. 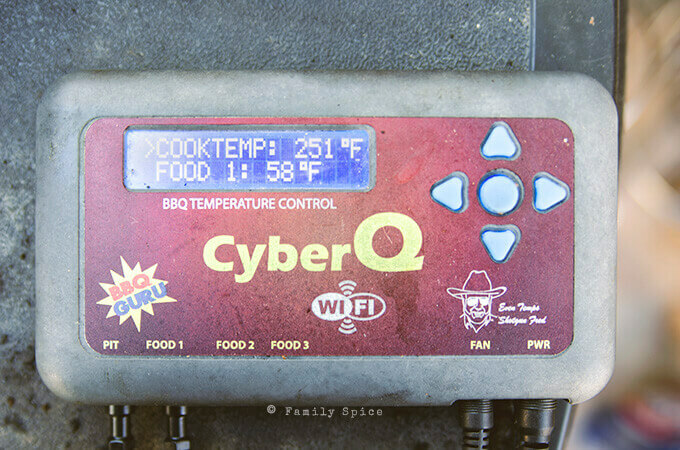 We love using our CyberQ BBQ guru to regulate the pit temperature with its little fan, during this time. We receive text or email messages giving us updates on the pit and the meat temperature while it cooks. Let your grilled prime rib rest again! One of the biggest mistakes most people make when serving up a roast or steak is to carve into too soon after it is done cooking. It is crucial to let your smoked prime rib rest for 20-30 minutes so the juices reabsorb into the roast. Your roast will not get cold, but will actually rise in temperature by about 5-10 degrees. And you will have a perfect medium rare prime rib roast to serve to your guests. Okay, some of you have your grills buried in snow right now and can’t take advantage of grilling a prime rib roast outdoors. Have no fear. You can prepare it in your oven, although you will be missing out on some serious smoky flavor. I received two roasts from Harris Ranch and prepared one on the grill and one in the oven. The oven technique I really like to use is super simple. Place your roast, bone side down on a roasting pan. Heat your oven to 500ºF and cook your roast for 5 minutes per pound of your roast. So, I had a 9.5-pound roast, and I cooked it at 500ºF for 5×9.5= 47.5 minutes. Yes, your kitchen will smoke up so have the kitchen fan running during this high heat stage. Once you blasted your roast at the appropriate time frame, turn the oven off, but leave your roast in there. DO NOT OPEN THE OVEN DOOR!!! Let your roast sit in the oven for 2 hours or until the internal temperature of the roast reaches 125ºF. It’s a good idea to have the meat thermometer inserted inside the roast when you first put it in the oven. I also have this recipe to cook a boneless rib roast in the oven. So there you have it. 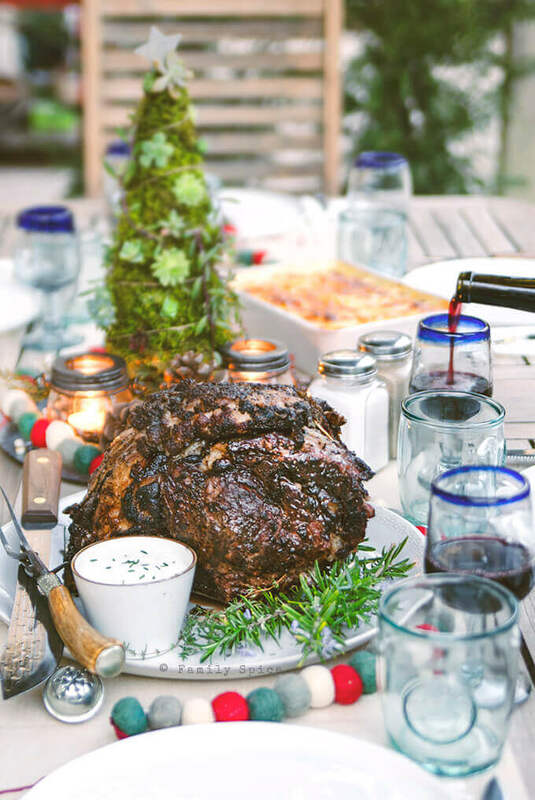 A Christmas prime rib roast served up California style, smoked and on the grill. This baby is too good to enjoy just once a year. So whenever you have grilling weather, a smoked prime rib roast is not too far away. 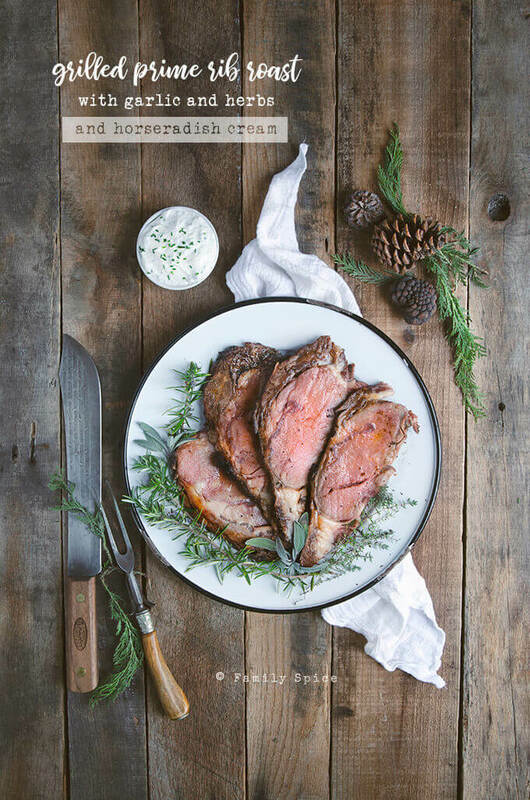 When you want to serve a special meal, this melt in your mouth tender Smoked Prime Rib Roast is grilled to medium rare perfection with a delicious garlic and herb crust. In a small bowl combine olive oil, herbs, garlic, salt and pepper. If your butcher has not done so, trim prime rib roast of excess fat, leaving only 1/4-inch fat around it. If you want the bone to be revealed during the grilling process, trim 1-2 inches of fat from the bone, but leave the bone intact. Place roast on a baking sheet and rub entire roast with herb mixture. Let roast rest on the counter at room temperature for approximately 3 hours. 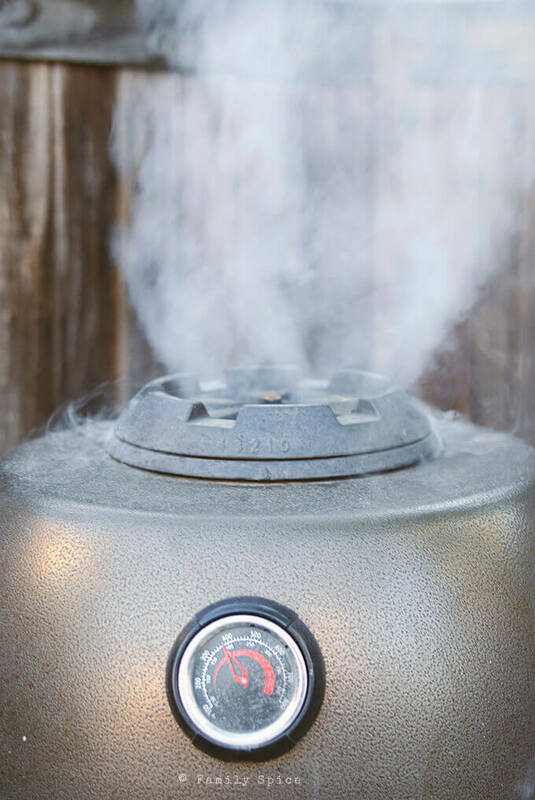 Heat the grill to 250ºF with indirect heat. If smoking the roast, add wood chips, as well. Place the roast on the grill, fat side up. Cook until the internal temperature of the meat reaches 110ºF, approximately 3 hours. Increase grill temperature to 400ºF and continue grilling until internal temperature reaches 125ºF for medium-rare, about 45 minutes. Remove roast from the grill and let it rest 30 minutes before slicing. While roast is cooking, prepare the horseradish cream. Combine ingredients and refrigerate until ready to use. Slice roast and serve with horseradish cream. To cook in the oven, place your roast, bone side down on a roasting pan. Heat your oven to 500ºF and cook your roast for 5 minutes per pound of your roast. So, I had a 9.5-pound roast, and I cooked it at 500ºF for 5x9.5= 47.5 minutes. Once you cooked your roast for the appropriate time, turn the oven off, but leave your roast in there. DO NOT OPEN THE OVEN DOOR!!! Let your roast sit in the oven for 2 hours or until the internal temperature of the roast reaches 125ºF. It’s a good idea to have the meat thermometer inserted inside the roast when you first put it in the oven. Disclosure: I did receive a stipend from Harris Ranch Beef Company to develop a recipe using their prime rib roast. The story I have written is all true, and the opinions are truly mine. If I didn’t like it, I wouldn’t blog about it. This looks like an incredible new recipe to try for the holidays. I love Harris meats and we are lucky a small produce market in town carries quite a few different cuts of their meats. Dang, woman! This looks and sounds amazing! I’ve heard wonderful things about Harris Ranch. Thanks for the review and for the fantastic recipe! This looks terrific! Love a standing rib roast, and yours looks superb. Thanks. And Happy Holidays! Great job on behalf of Harris Ranch. 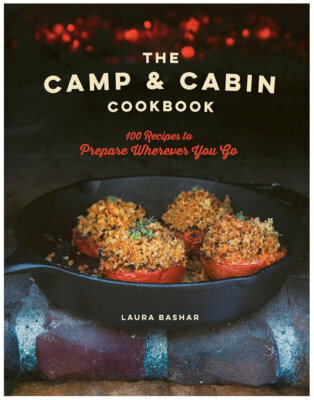 Recipes and photos look great. Looking forward we should plan on doing something in advance of grilling season. Steaks for grilling concept. Thank you for reaching out. We love Harris Ranch and your meats are always top quality. Hope you have a fabulous 2019 and looking forward to working with you all again! This is such a perfect recipe for holidays and family parties! That herb garlic crust is epic! Thanks, Liz! The herb garlic crust really is something special! Prime is my very favorite special occasion treat! This recipe is going to be the one I try out next, delicious! Wilhelmina, my family really loves prime rib. What’s not to love, right? !